Fetal Bovine Serum (FBS) - Heat Inactivated, NZ Origin - NOVA Biologics, Inc.
Our Premium Grade FBS is collected from registered export abattoirs under the supervision of government veterinary authorities and is manufactured in a fully validated sterile filtration facility under strict GMP conditions. Bottles are heat inactivated at 56⁰C (± 1⁰C) for 30 minutes. Additive in growth media for tissue and cell culture. Research or diagnostic assay reagent. 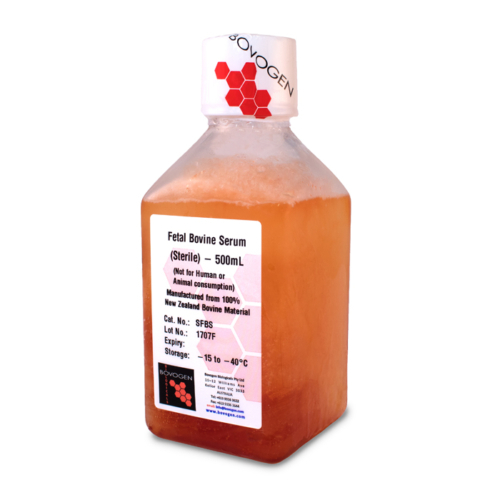 NOVA Biologics, Inc. is the authorized distributor of Fetal Bovine Serum for Bovogen Biologicals New Zealand origin bovine products in the USA! All Bovogen Biologicals’ FBS is collected from registered export abattoirs under the supervision of Government Veterinary authorities. Bovogen Biologicals’ FBS is manufactured in a fully validated sterile filtration facility under strict GMP conditions. Our serum follows an aseptic control flow process aligned to the following inclusions. Our fully disposable sterile filtration process ensures serum only comes in contact with single use equipment. This means each new batch uses new and dedicated equipment which is disposed of at the the conclusion of each batch. All critical release testing performed on Bovogen Biologicals’ FBS is outsourced to suitably qualified and certified external laboratories. This provides independence in relation to test results reported on the Certificate of Analysis. Our FBS caters for all unique applications and regulatory needs around the world, to include the following validated offerings for our customers. Surpassing quality and specification, there are significant reasons why Bovogen is now a most valued and sought after FBS supplier worldwide. * This is a guide only and our formal documentation may have some variation in terminology and reported tests. Please contact us for more information.